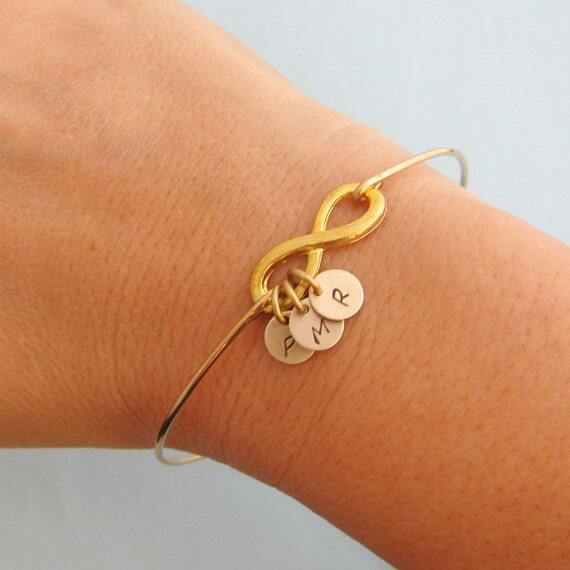 This single friendship bracelet comes standard with 3 initial charms. Please mention your initials in "notes to seller" during checkout. ***Please note this jewelry is not intended for infants or children as they could be tempted to put jewelry into their mouths... As with any bracelet it could be a choking hazard if any part were to somehow come loose. Thank you. Select infinity finish in gold or silver, and bangle band finish in brass, silver filled, 14k gold filled, or sterling silver. Please mention order of initials in "notes to seller" during checkout. If you want the same order on all 3 bracelets, or if you want a different order on each bracelet. 3 Way Friendship Bracelet - Order a bracelet for you and each of your friends. 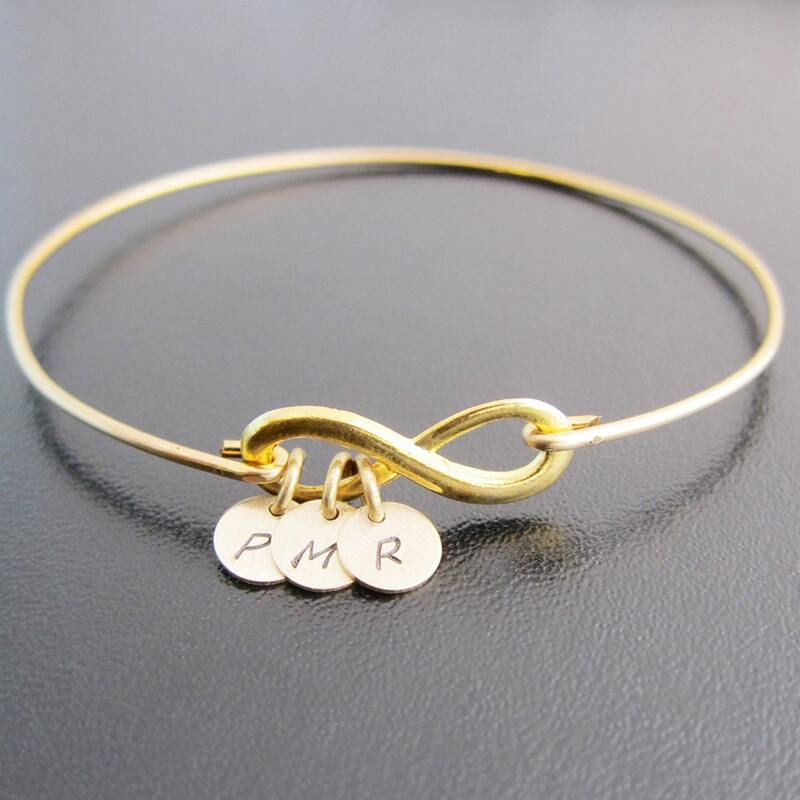 You can request the initials in the same order on all 3 bracelets-- or you can put the wearer's initial first or in the middle of each bracelet. The choice is yours. Order one for each friend in the group! And please let me know the order of initials for each bracelet. And if you have up to 10 best friends, I could always make this set with up to 5 initials in each loop. Please specify size in "notes to seller" during checkout. Choose from one of my regular sizes below by measuring one of your favorite bangles, or give me the circumference of the widest part of your hand where the bangle has to be pulled over; then I can size your bangle for you. All of my bangles are closed and can’t be opened. 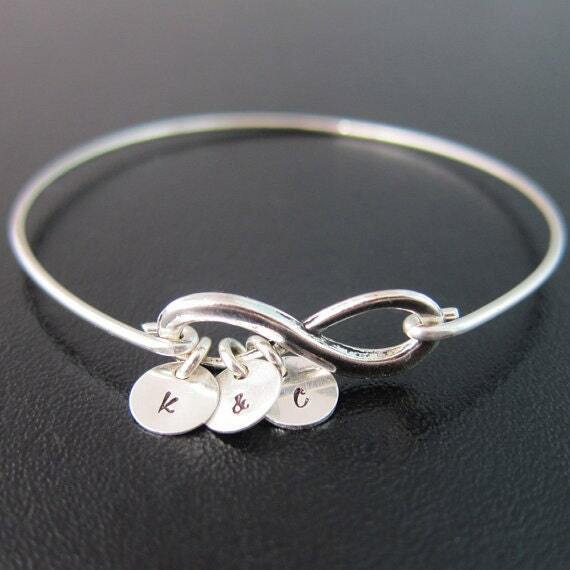 Therefore, this custom bridesmaid gift bracelet has to fit over the hand. *** This listing is for 1 infinity bracelet... 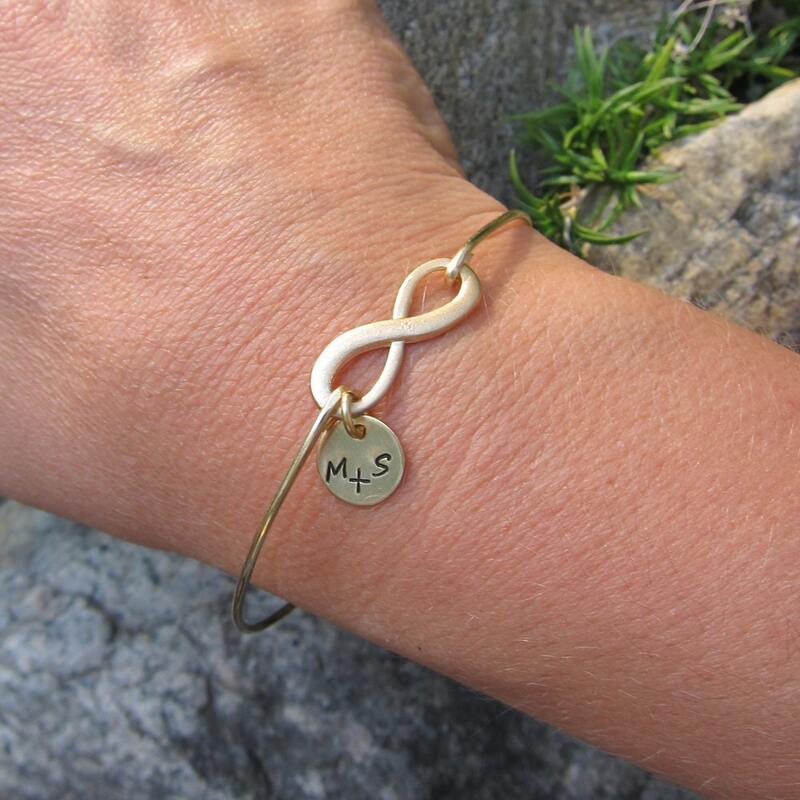 If each friend in the group would like their own bracelet, simply add the appropriate number of infinity friendship jewelry bracelets to your cart when ordering. I can package each infinity friendship bracelet you order in its own pretty box to give as a friendship gift. Just mention in notes to seller during checkout for your gift bracelet. This jewelry created and hand crafted with great care and love for you and yours. All of my bangles including this bracelet are special handmade creations that are based on original Frosted Willow designs & concepts. I hope you love this friendship bracelet for 3 people design.